The date is the 22nd of November 1990. In his grey pinstriped shirt and grey trousers, Marcelo Alberto Bielsa Caldera is doing what he always does when he is at the side of a football pitch, the thing that has driven him to glory and madness over the past 30 years: working out how to win. Bielsa, in the 1990-91 season had been stood on the side-line of the stadium of Newell's Old Boys, one of two teams in Rosario, Argentina’s 3rd largest city. For 19 matches he has been calculating the most efficient way for his team to do what he said “was the only thing [he] would accept”, what he only ever accepts: win every game. The stadium in which he sat didn’t have a real name - not then - but just a nickname: El Coloso del Parque. The park was Independence Park in the centre of town, a lush, green area that is home to fountains, Greek-looking architecture and gleaming, bright, white statues. Since 1911 the stadium has been sat in the middle of the park, looking as out of place as though it had been picked up by the hand of God, thrown half-way around the world and landed in the most uncomfortable yet charming of locations. But on that Thursday, in 1990, nobody is looking at the statues and the stadium is silent. The people who normally take the park for a quiet stroll are at home or in the local bar looking at the 22 men running around the not-so-green football pitch. And the 22 men are definitely not playing like the statues in the park. Newell's can win the league today; one target is all they have as a team: do not lose. The team are playing away against San Lorenzo, the team sitting at the top of the bottom half of the table in 11th place. But, they only manage not to lose. A glorious free-kick from Newell's number 11 Cristinan Ruffini is cancelled out by a Roberto Carlos-esque free-kick from San Lorenzo’s Zandona. Newell's haven’t done it. Only they have. River Plate, Newell's closest challengers, slip up to 3rd place Vélez. The red and black of Newell's Old Boys were league champions and River Plate’s red and white would be used to wipe the tears of the fans; two points separated the two teams at the end of the first stage of the 1990-91 season and it was Bielsa’s boys who were the kings of Argentina. The fans ran onto the pitch to celebrate with the players; like elated dogs greeting their owners they swarmed the manager and lifted him aloft. Bielsa, in the madness, had managed to get a hold of a Newell's shirt; one-half red, the other half black, only interrupted very quietly by the white of the word “Yamaha” emblazoned on the front. He, sat on the shoulders of fans like a swarm of bees carrying its Queen, lifted the shirt over his head and with an adrenaline-fuelled fist, knuckles white, he screamed: Newell's, carajo! Whilst the translation of this into English has many variations, none of them are perhaps appropriate for publishing. Bielsa’s war cry was captured on camera, making for entertaining viewing and stands as an historic, iconic moment for all fans of Newells and Argentinian football. Bielsa would take on management jobs in Mexico before being called by Real Club Deportiu Espanyol. It is not controversial to say that for all of their existence, Espanyol have served as FC Barcelona’s very little brother. Bielsa managed Espanyol for 6 games, suffered 3 defeats including a loss to Valladolid and his team was shown 3 red cards. The job itself, however, was always destined for failure. 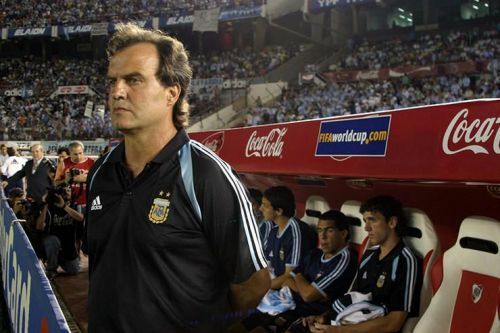 After just one month into his tenure, on August 17th 1998, Bielsa was contacted by the Argentinian Football Association (AFA), who wanted him to take over as national team coach after Daniel Passarella. Bielsa had it in his contract that he would be allowed to leave should an offer come in from the AFA, and had agreed to stay on until December after the initial contact. His head was turned by his home country and left Espanyol after a meeting in which it was decided he would rescind his contract; so disgusted was the Espanyol President he did not even attend. So Bielsa took over his home nation’s national football team. The dream job of any manager. But it was after this stint where Bielsa became El Loco. It happens in every superhero film, except for Bielsa there was a difference. For the Argentine, the radioactive spider was an entirely self-inflicted move. Bielsa locked himself away in a convent for 3 months with no television and no phone, just books he had wanted to read, but had never previously found the time. After spending one-quarter of the entire year wrapped up in a religious convent with no contact from the outside world Bielsa decided to leave. But why? “I had started to respond to myself,” the manager revealed. Since then, he has taken on jobs in Spain, France and most recently, England. He has been explosive at times if not underwhelming, a rogue cup of coffee placed on his Marseille cool-box being his most memorable moment in the French league. However, the cult of Bielsa has never (and arguably never will) died down. In Spain they still sing of him, his supporters' club is bigger than ever and his every move in England is now given coverage in Spain’s sports daily newspapers. Leeds United are just finding out about El Loco - not for the first time England has been last to the party regarding the acceptance/acknowledgement of continental fads. Just think of 4-2-3-1. “Spygate” is a debate for another day but it will in be the headlines for months. If Leeds go up, they will be reminded of it. They will also be reminded of that special day in 1990, and no doubt lift Marcelo Alberto Caldera Bielsa aloft, not for the first time in his life. 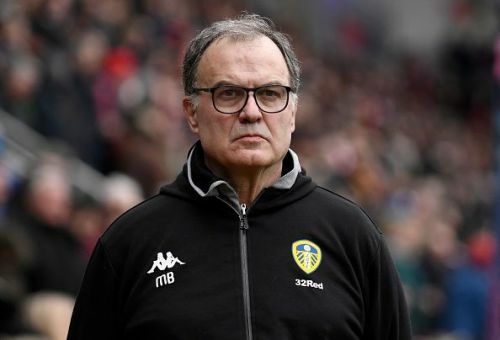 Bielsa has the potential to become a God at Leeds, to become eternal and etched forever in the hearts and souls of the Yorkshire team and its fans. He can become a God like the one that placed the Newell's Stadium where it is, like the one with whom he went to live over 20 years ago.